And who doesn't? A big bowl of buttered popcorn is one of my favourite snacks. Maybe it was because my very first job was working at the concession counter of a movie theater. We made the popcorn and drizzled real melted butter on top. When we weren't busy, we would go to the back room and dip our popped kernels into the salty foam on the top of the butter - yum! If you are serious about good popcorn, you know it isn't cooked in the microwave. The proper way to pop real popcorn be found here. For something a little different here are links to a few recipes - both savory and sweet. For an Academy Award party one year I made Rosemary - Parmesan popcorn. It was delicious! And for those with a sweet tooth, try this Caramel Corn recipe. If you crave more sugar, add your favourite candy and chocolate and return to the oven for another 10 minutes. So find a great movie and pop up a batch to celebrate. My husband is addicted to popcorn. He makes it the real way, on the stove, no less than 4 times per week and he doesn't stop at one batch. My favourite way to have it is with soy sauce sprayed on (from a misting bottle) topped with good tasting yeast, then tossed. Yum! My husband is addicted to popcorn. He makes it no less than 4 times a week and he doesn't stop at one batch. My favourite way is with a spray of soy sauce and a sprinkle of good tasting yeast all tossed together. No buttery calories. Yum! Thanks for the tip Les. I will give it a try. Why the yeast? My youngest is getting her braces off soon and she can't wait to eat popcorn once again! 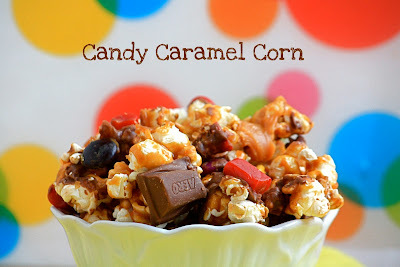 I think I will try to make your caramel candy popcorn. Looks yummy.